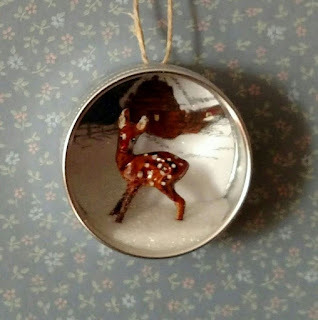 This project was for a 3D ornament swap at our recent "Let It Snow" Stamp & Swap Event. I saw these 1" X 2" tin containers used on several Pinterest projects & thought it might be cute for the swap. My friend, Diane had extras so I bought a box of 9 from her but there are many places you can get them online. This is what I came up with...isn't Rudolph cute standing in the snow? 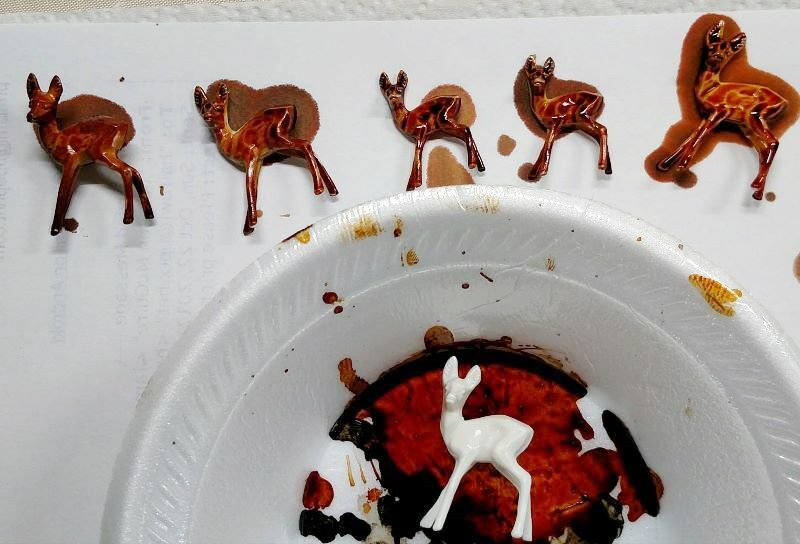 I started by coloring the Tim Holtz Idea-ology Decorative Deer with Adirondack Caramel Alcohol Ink & letting them dry. There are 2 sizes & I used both. 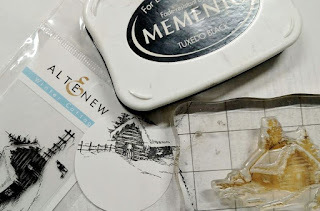 After die cutting a 2" white CS circle from Spellbinder Circles Die, I partially stamped Altenew's Winter Cottage in Memento Tuxedo Black Ink at the top so it would appear to be in the distance. 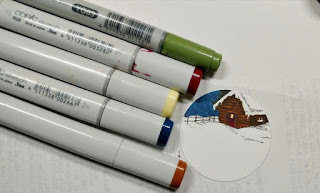 The image was colored with Copics: B37(sky), E99(cabin), Y11(windows), R39(door), YG63(tree). 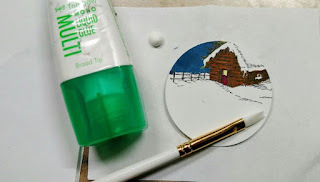 I painted Tombow liquid glue over all the areas with snow including the roof, window sill & a dab on the tree branches. 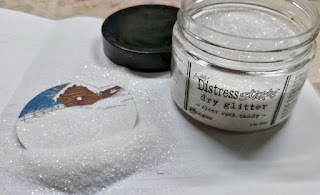 I quickly covered the circle with Tim Holtz Clear Rock Candy Dry Glitter. This glitter is the best, it's very fine & does not have any color...it glistens like real snow! After the alcohol ink was dry, I used a SU Chalk Marker to add spots & white in his ears. 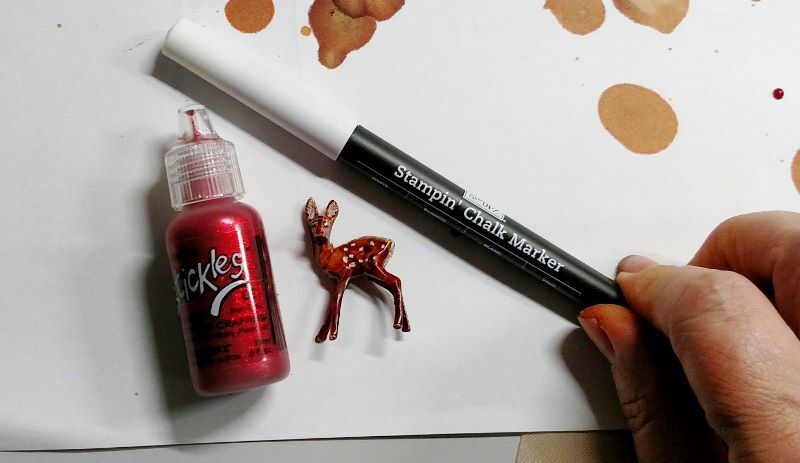 I also put a dot of Ranger Christmas Red Stickles on his nose so he looks like baby Rudolph. 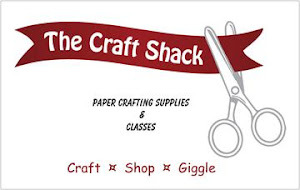 Using a We-R-Memory Keepers Crop-a-dile, I punched 2 holes for the jute string hanger. I added the cabin scene to the back of the tin with Ranger Glossy Accents. 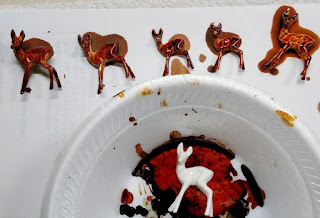 To keep the deer in place I stacked small pieces of Scotch 3M Form Mounting Tape to the back of the deer then added glossy accents around his feet. I then put more dry glitter in the tin & secured the lid with glossy accents. 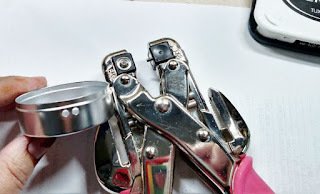 Just one tip - I didn't think of this until after I had glued the lids on but I would put something over the holes on the inside, maybe a small piece of clear tape. 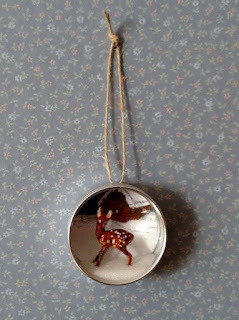 I'm sure it'll be OK but if it's tipped upside down it may lose the glitter but over all I'm pleased how it turned out! TFL! I just love this. It is adorable.